Ellie adores her Daddy. She follows him everywhere and is interested in everything he does. He has earned every bit of that adoration, as he is a loving, gentle, patient father who dotes on her. They have been trapping gophers out by the pasture this week. 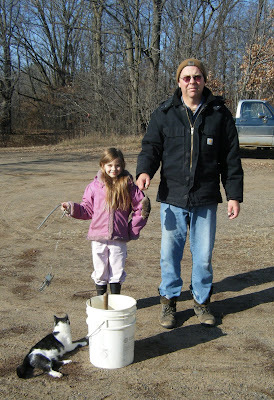 Tom is holding today's catch and Ellie is holding the traps. Spot the cat is waiting to see if they will share their booty with her. They did, and Spot was very pleased. Some of Tom's happiest memories are of trapping with his dad, and he is enjoying doing the same with his children. 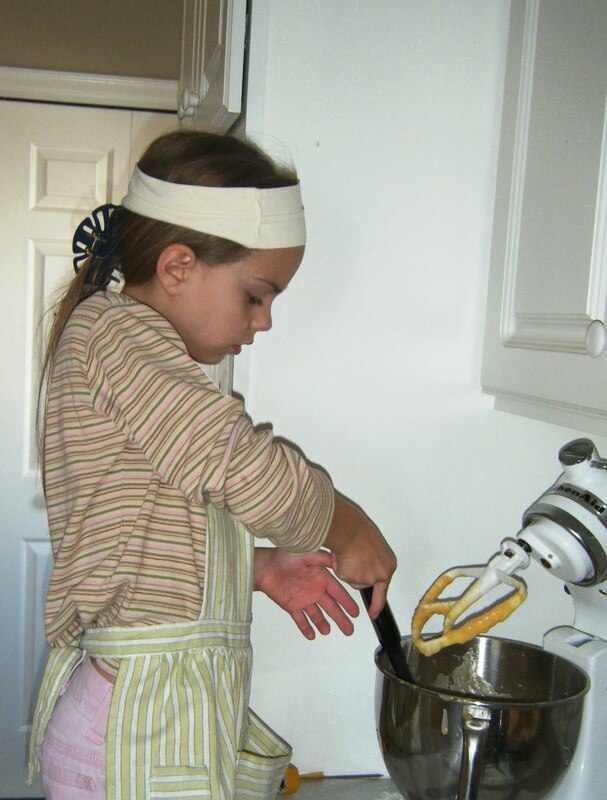 Later, Ellie decided to bake some pumpkin bars (Daddy's favorites) all by herself today. It was the second time she had baked anything and even though I felt compelled to loosely monitor her activity, she read the ingredients and put the recipe together herself. I helped put the pan into and out of the oven, but that was all. I am so proud of my big seven year-old. School subjects learned and practiced today? History in the morning, her favorite subject. (Today: The ancient Phoenicians, Tyre, and the establishment of Carthage. We watched a demonstration of glass blowing and she worked on a map of the major colonies and Mediterranean trade routes and colored a drawing of a Phoenician trading vessel. Later this week we will be dyeing some fabric purple, but won't be using snails to make the dye like the ancient Phoenicians did!) I feel I owe a debt of gratitude to Susan Wise Bauer for her history books and workbooks. They are simply wonderful. Ellie and I both love history with Susan's books. Baking was a great exercise in general math concepts as she's beginning to understand fractions and measurements without even realizing it. She also got in some great practice reading. I was surprised at how easily she read the recipe as she seems to struggle more when doing reading as "schoolwork". This type of activity is a great confidence-builder. I'm learning to be more relaxed and deviate from our schedule when opportunities arise. I love homeschooling. There is reward and satisfaction around every corner. Tomorrow is Tuesday, the day we have scheduled for Science. I think we'll study gophers. What a perfect day. Inspiring. One of the finest moments of fulfilling my civic duty. Grandma is ever blessed! I get to eat her pumpkin bars, at least I did from the first batch. I can testify to their deliciousness. I love you all so very much. Nina, we don't have a bounty on them in this township. I wish we did, as we would love to participate in one. I'm sitting here imagining you at a desk with gopher feet getting plopped down in front of you. Ewwww.